Peach in Pink, originally uploaded by Misty DawnS. 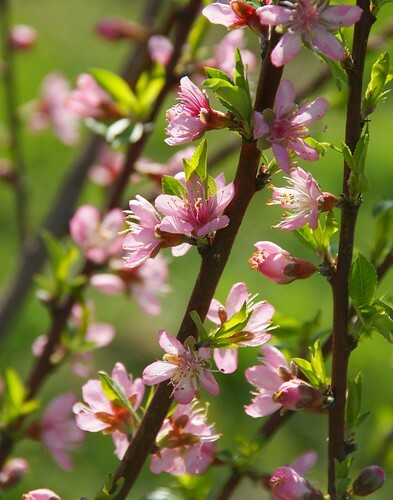 If you are someone who watches my attempted-to-be-daily posts on Flickr, you will have noticed that I seem a bit obsessed with my blooming peach trees lately. To be honest... I am. LOL These blooms are the first signs of spring around here, and they are in a good spot to catch the sunlight when I'm outside with the camera. Therefore... to put it simply... I photograph them. Also, so far, I've seen two bees, a Ladybug (they're good luck! ), and a moth visiting these trees. All the more reason for me to be obsessed with them! Besides, don't you think a toned-down, more transparent version of this would make a great background for spring cards? They are absolutely beautiful, Misti! I am still waiting for something (anything!) to bloom here in the Pacific Northwest. It would be beautiful to print those on some note cards too! It's a good obsession to have. We wait so long for the blooms to finally appear and they last such a short time. You have to enjoy every moment you can! What a beautiful photograph Misty! I love your new blog design also!! I would be obsessed too! I agree with you on the bridal shower invitations. I just love flowering trees.